Telstra has revealed details of one of the first 5G commercial devices that will be available to its customers. The telco today demonstrated the HTC 5G Hub connecting to its live mobile network in Sydney. Telstra said that connecting a commercial 5G mid-band device to a live network represents a world-first. The device is expected to go on sale in the first half of next year; Telstra has not yet released pricing. The telco has also revealed its latest 5G test device. The prototype handset built by ZTE appears indistinguishable from a regular 4G smartphone and is a far cry from the early devices Telstra used to test 5G. Telstra’s initial test device, deployed at the telco’s 5G Innovation Centre on the Gold Coast, weighed around 200 kilograms. 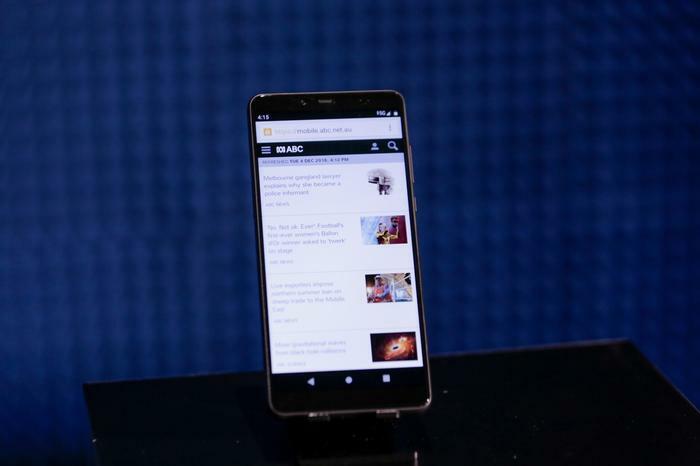 Earlier this year the company announced it had made its first end-to-end 5G data call on its network, employing a desktop PC-sized device made by Intel. More recently Telstra has used a Qualcomm Technologies device about the size of an iPad Mini, but significantly thicker. A third device on display at today's 5G briefing was a prototype mobile hotspot built by Inseego; like the ZTE handset it was almost indistinguishable from the 4G-equivalent device. Telstra said it is working with a range of additional device-makers in the lead-up to the launch of 5G services. The telco also said it had conducted the first 5G-to-5G video call using its commercial network and licensed spectrum. The call employed the Qualcomm mobile test device, which is equipped with the Snapdragon X50 5G modem. Telstra has been upgrading its base stations in preparation for the launch of 5G services. It expects to have 200 5G-ready sites by the end of the year. “Everywhere that we’ve turned on a 5G tower, we’ve actually upgraded our 4G network to gigabit capacity,” said the telco’s networks head, Channa Seneviratne. Telstra today revealed that it would launch its first 4G device that is capable of a theoretical maximum speed of 2 gigabits per second. Earlier this year the company provided details of its tests of 2Gpbs speeds, achieved by aggregating five LTE carriers. Telstra said it will launch the Netgear Nighthawk M2 hotspot in February 2019. Telstra, along with Australia’s other mobile network operators, is currently waiting on the outcome of the government auction of key spectrum for 5G. The Australian Communications and Media Authority is auctioning off spectrum 125MHz of spectrum in the extended 3.6GHz band. Telstra has been using adjacent spectrum in holds in the 3.4GHz for some of its 5G trials, but it doesn’t hold any spectrum in that band in Melbourne and Sydney.